Knock at my parents’ front door and you are more than likely to be greeted by my dad exclaiming “Not today thank you!” and then promptly shutting the door again. Yes, it’s a ‘dad joke’ of the first order and one that my dad certainly never tires of. Also in my dad’s repertoire is “Did you enjoy your trip?” (for when you fall over) and “I know you’re a pain/pane but you’re not made in a glass factory!” (for when you are standing in front of the television blocking the view). 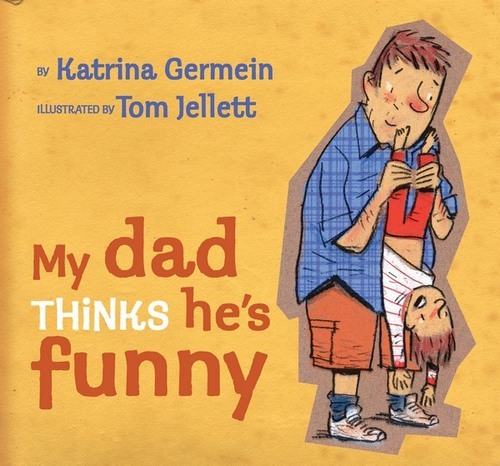 So when I picked up a copy of My Dad Thinks he’s Funny by Katrina Germein, I wasn’t sure who I was actually buying it for – myself, my kids or my own dad. Doesn’t really matter because we have all enjoyed it. My Dad Thinks he’s Funny is a perfect anthology of dad jokes. All the favourites are there from “Whenever I say “I’m hungry,” Dad says, “Hello Hungry. Pleased to meet you.”” and “Would you like some dinner with that sauce?” through to dads’ ‘special announcements’ that can clear a room in an instant. I know my dad thinks he’s funny and actually I think he’s funny as well, even if I have heard the jokes a million times. I’m fairly sure that my dad didn’t pick up any new material from this book but keep in mind he’s had the gig for more than thirty-eight years! For new dads, My Dad Thinks he’s Funny is packed with gags that will keep their children rolling their eyes in embarrassment and groaning out loud for decades to come. My Dad Thinks he’s Funny is $24.99 and is available online at Fishpond.